As part of Corus Port Talbot’s quest to find alternative forms of energy, a large steel framed gas holder has been commissioned. Martin Cooper visited a project with environmental, cost and energy efficiency credentials. A major energy efficiency scheme has been commissioned at the Corus Port Talbot steelworks in South Wales, with structural steelwork playing an integral role. The new BOS Gas Recovery Project will allow the facility to harness the off-gas, rich in carbon monoxide, generated by the steel making (BOS) process as a source of energy for on-site power plants. To facilitate this new process, a large gas holder along with 3km of associated pipework and two 70m high stacks, have been built with steel, which was fabricated, supplied and erected by Rowecord Engineering. Explaining what all of this new installation is producing, Corus Project Manager Guy Simms, says: “This isn’t new technology nor is the concept as there are many plants around the world and within the Tata Steel Group already recovering BOS gas. This is easy to understand, as it is obviously better to harness the energy in the gas by making electricity rather than to burn it. Previously, all BOS off-gas produced at Port Talbot was flared off. Now it replaces Coke Oven Gas (COG) to supply power plants, with the knock-on effect being a 60% reduction in on-site natural gas imports. Natural gas is currently used to fuel the reheat furnaces in the hot mill, COG now not needed for power plants is diverted here instead. The expectation that energy prices will remain high, combined with the pressures linked to climate change and CO2 generation, have driven the project along with the site’s long term vision for energy self-efficiency. Remarkably the payback period for this multi-million pound project is only two years. “Every year after that there will be an ongoing financial benefit, derived from less natural gas imports and a 15% reduction in electricity imports as well as the social and environmental benefit of reducing our CO2 emissions by 250,000t per annum,” explains Mr Simms. Central to the scheme is the new 75,000m³ gas holder which has been constructed roughly equidistant between the power plants and the BOS plant. Approximately 2,700t of steelwork went into this large structure which is 63m-high to the apex of its roof top vent, 54m in diameter and erected from steel plates. 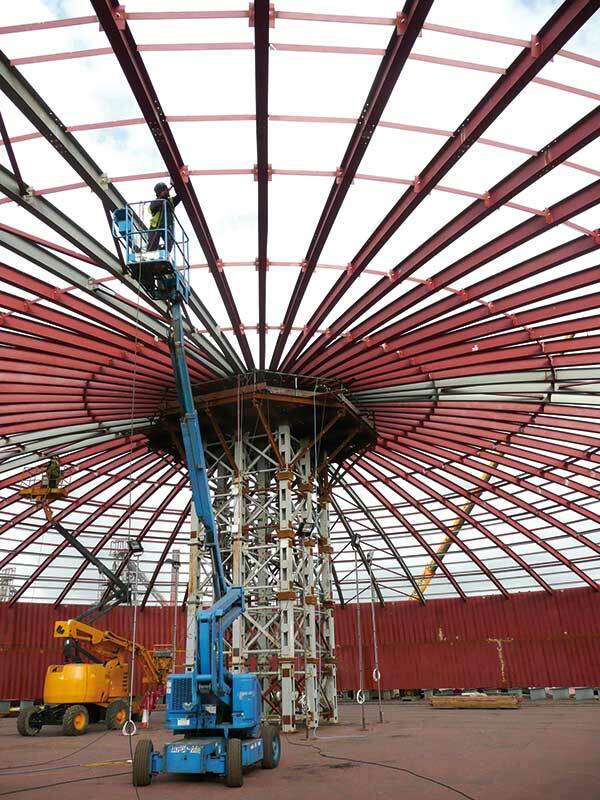 Constructing a large gas holder is not an everyday occurrence and John Blackwell, Managing Director for Rowecord says they followed the advice of project designers Lazarus, a company that has built similar type structures all over the world. Early works on site involved ground preparation and piling, prior to a concrete slab and a steel floor plate being installed. 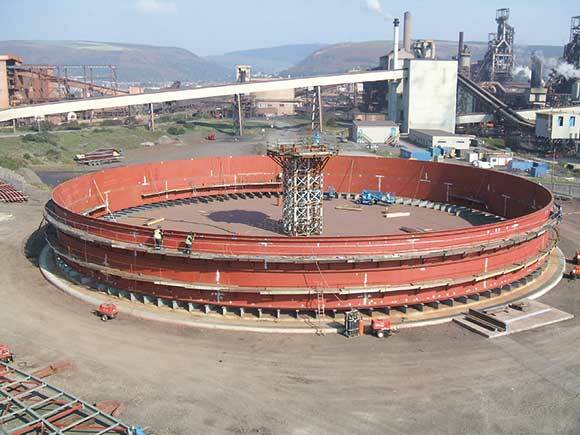 This then allowed the main steel erection programme to begin, with the uppermost ring of plate steel installed first. Each steel plate is 2.4m high x 11.3m long and one circumference – with welded connections – took seven days to complete. Next the roof framework was erected consisting of a series of 600mm deep rafters which fan-out to the perimeter from a central point that was temporarily supported on a trestle. The roof structure also includes steel bracing while all connections for this part of the structure were bolted. Once the roof was clad the structure was raised by a series of hydraulic jacks placed around the circumferences. 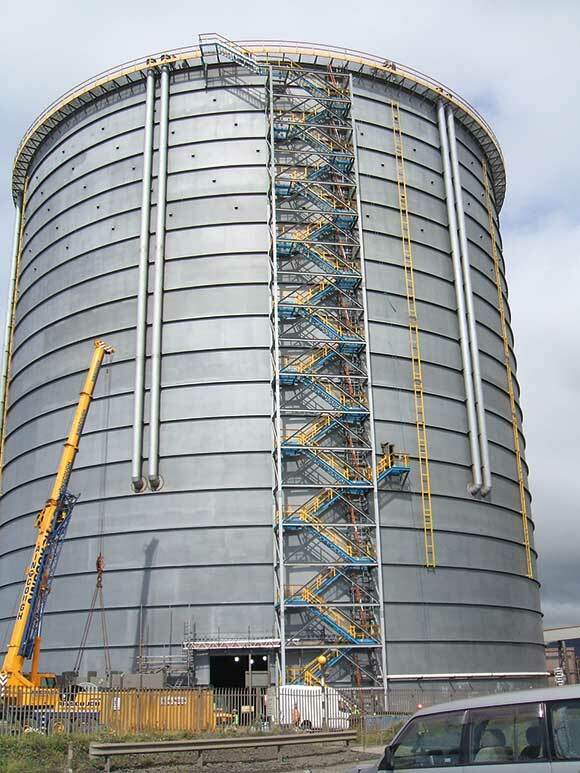 The jacking process took approximately five hours and raised the entire steel ring 2.4m, which allowed another complete circumference of steel plates to be installed, before the process was carried out again and again until the gas holder reached its full height. As each successive circumference of steel plates was inserted the structure’s weight increased and so the number of jacks had to be increased from 24 at the start of the procedure to 120 units at end. Likewise, the steel plates’ thickness also increased – due to extra loadings – from 10mm for the upper rings to 16mm thick plates at the bottom. The final steel ring included a 6m wide access opening, which served the dual purpose of allowing the cherrypickers, used inside the structure’s footprint, an exit route and allowed the gas holder’s internal steelwork to be inserted. Internal steelwork was brought to site ‘piece small’ and once inserted via the access door it was bolted together. This steelwork most importantly included the 18m-high piston which when assembled weighed 480t. As gas enters the holder the piston, which rests on a lattice framework at ground level, rises to 1.5m from the roof when full. As the piston rises an attached rubber membrane, fixed to both the piston and the wall of the holder, unfolds and acts as a seal preventing gas leaks. “Almost every works area in Port Talbot will be affected by the project in one way or another and most have required some engineering work. Even outside the site there were a number of challenges, due to the size and geometry of the components, which were delivered. All in all, the logistical challenges have been very demanding,” sums up Mr Simms. What else does the project involve? Aside from the gas holder, Rowecord also fabricated and installed 3km of pipework, from the BOS plant to the holder and then on to the power plants. Pipework taking gas to the holder is 2.6m diameter, with the longest section brought to site being 40m-long. Exiting the holder the pipework is 1.2m diameter due to the gas being less dense as it has undergone a dust extraction process within the holder. Three new flare stacks, to burn off excess gas, have also been erected. These chimney-like structures weigh 160t and were fabricated by Rowecord from steel plate and delivered to site in three sections and welded up on site.